Viewed from the other side, from President Trump's perspective, the UK is an important trade partner to the US. For both imports and exports it comes behind the immediate neighbours, Canada and Mexico, with which the US has a trade deal: the North American Free Trade Agreement. The US also does more trade with China (at least it does before the full effects of new tariffs are felt). As a source of imports, the Germany and Japan are also ahead of the UK. Bilateral UK/US trade has grown in the past few years, after period of relative stagnation in the aftermath of the financial crisis. The chart below uses data from the Office for National Statistics (ONS) which suggest the UK exports more to the US than it imports. The US figures suggest the reverse. In principle they cannot both be true. The ONS says there are many reasons why the figures might diverge and they are working on it. The goods traded cover a wide range, but there a few types that stand out: aircraft coming (or flying) into the UK, as well as scientific instruments. Going the other way to the US: cars and works of art. There is a substantial trade in both directions in medicines and power generation equipment. There is also an important trans-Atlantic trade in services, including finance, business services and tourism. The interconnections are also apparent in the data on foreign direct investment (FDI). This means either establishing a business operation, or taking a controlling interest in one already up and running - usually defined as holding of 10% or more. For Britain, the US is the largest source of FDI, as a single country. However, depending on exactly what is being measured, the EU as a whole can come out ahead. The US is also the largest destination for FDI abroad by British firms. Looked at from the US end, the UK is an important investment partner. The UK came second, behind the Netherlands, as a place that American companies invest, accounting for 13% of the total. And they seem to like operating here. The US State department says the UK "hosts more than half of the European, Middle Eastern and African corporate headquarters of American-owned firms". The UK is the largest source of FDI in the US, accounting for 15%. 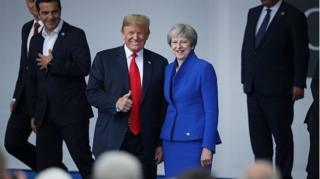 Donald Trump's visit: Why is he visiting the UK?